Americans can learn a thing or two about what not to do when trying to get their financial house in order by listening to the wrangling of our elected officials in Washington. It’s shameful to see our legislators bandying around the idea as a political maneuver, when it should be standard practice for corporations, individuals and ruling bodies to secure responsible money management. The process of becoming proficient at money management requires that you understand why your credit history is so important and then put into action the necessary steps to bring it under control. Having a poor history will have a significant negative impact on your credit score and make it difficult to buy a home, rent an apartment and even may keep you from some great job opportunities. Do you ave a personal debt ceiling? Like the Feds, there is a limit to the amount of money you can bring in. Even the wealthiest among us needs to balance their income and expenses to be able to effectively manage their money. It stands to reason that getting debt under control requires spending less than the income that is earned. 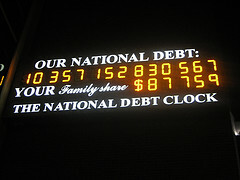 This is the control that is referred to by a ‘debt ceiling’ and is the benchmark for your personal debt limit. To be most effective, an actual figure that you won’t exceed needs to be put in place as your personal debt ceiling. Your personal debt ceiling should be no more than 40% of your gross income. For example, if your annual gross income is $40,000, your debt ceiling should not exceed $16,000. According to the Federal Reserve, households that spend more than 40% on debt repayment each month are considered in financial distress. For people who have reached the maximum income in their field, the expense side of the balance sheet needs to be considered to stay under their debt ceiling. With thousands of debt management articles giving advice and tips on personal finance and debt problems, there is bound to be some ideas that you can work into your way of life. Make one change in how you spend money each week and you’ll begin to have more available income to pay down credit card debt or make a larger payment on your mortgage or auto loan.